This week at our conference we had the opportunity to consider ways to develop phonics activities in target languages that help children understand the reading code of the new language. We consider the use of song, phonics in a target language,ways to record creatively written work, use of APPS and we briefly considered simple drama activities . Let's bring these all together and celebrate their use linking this to an authentic text in the target language! I have chosen for this example the comptine "Dame Tartine" ,as it's nearly the end of the school year and has a feel of a celebration cake! We will be focusing on one verse only but here are two video clips with subtitles that can help your class to read and practise and sing along with the comptine. Le parquet était de croquets. It's an amazing palace that's being described made from tasty sweets and cake ingredients. Let's listen to the whole comptine. Now let's listen to the first verse again with the subtitles visible. Play the first verse again and conceal the screen - how well can the children remember song? Draw an outline of the bedroom(walls/floor/bed/curtains) described in this verse and give each table an outline.Give out the five ingredients as word cards to each table.Ask the tables to decide where they would put each ingredient from the rhyme. Ask the table to say the rhyme to each other and decide where their ingredients should be stuck with blu-tac on the outline.Share the tables decisions. 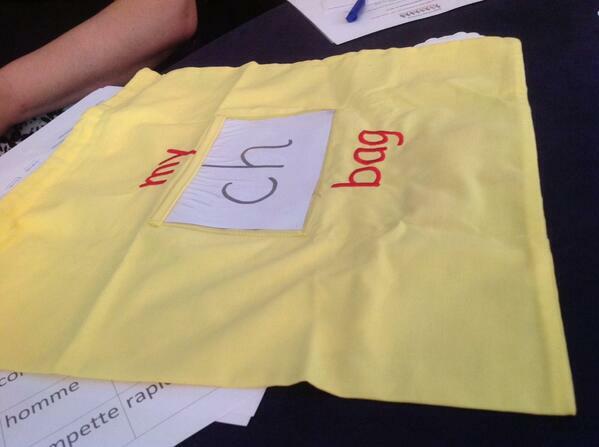 Now take the children phoneme - grapheme/letter string shopping like Julie Prince demonstrated at the conference.Each table needs a bag with a grapheme or letter string of a sound contained in one or more of the ingredients.Take a look at the picture here. This really brings out the competitive element! More than one table may have a sound on their bag this is contained in the ingredient noun. The table that reacts quickest and loudest will win the ingredient! Can the children match the items in the rhyme to the ingredients.Give out to pairs the words for the items and the words for the ingredients . Play the comptine first verse again ....where they correct? Or do they need to reorder some of the components? Now add a touch of drama and performance.Ask the children to imagine that they are museum curators. Can they take it in turns working with a partner to show visitors around an the very special bedroom of this "palace".Can they not only make it sound delicious but also look delicious too? Step Five:Making a written record and writing creatively in the target language. Let's make a mini book record of the Dame Tartine.A glorious celebration cake shaped mini book with flaps for the door where "la dame Tartine " can be seen and a flap (upon which is written the description of the items from the comptine) .When you open the flap it reveals the bedroom with the floor, the walls, the bed and the curtains all decorated as calligrams with the words for the ingredients. Why not let the children create another bedroom in the palace with calligrams of different ingredients - you can decide how many of the ingredients must rhyme with the items depending on how challenging you want this to be. 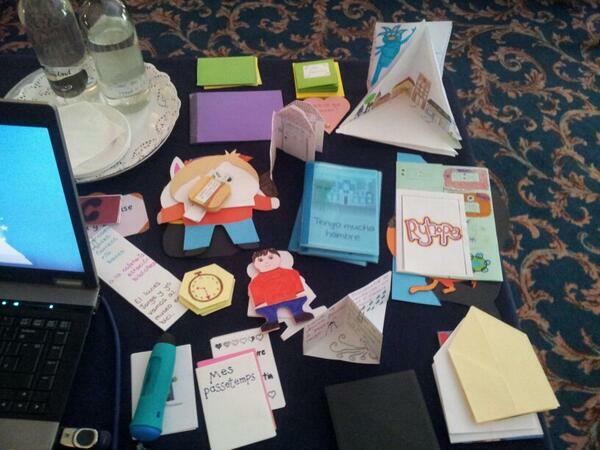 Find out more about @vallesco's mini books here. One sequence of lessons leads to another and one of the great things about the colleagues mentioned in this blog is that we all inspire each other and challenge each other to try new ideas. Julie Prince has developed a sequence of lessons, inspired by this blog post on one of her favourite action rhymes trois petits chats. I love it! Hope you find it useful too!